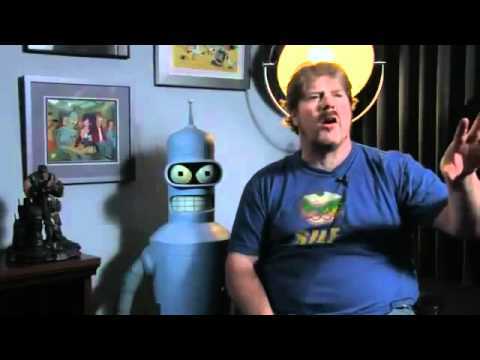 John DiMaggio and his team have written a love letter to his industry, in the wonderful documentary I Know That Voice. Voice acting is a pretty overlooked field. I Know That Voice gives you a nice look into work that goes into, and the faces behind the industry. The documentary covers a wide range of topics, from the history of the form to getting jobs. A huge variety of artists are interviewed, and you really get a sense of how talented these people are. Sure, it’s fun to see the actual faces behind so many of the characters I’ve watched over the years. That’s just neat on its own. But IKTV is more than that. This is a professional craft that from the outside looks way easier than it actually is. It’s certainly not just doing “funny voices”. The artists give you plenty of examples of why their craft is special. To vocalize a consistent character for hours at a time, giving a performance isn’t something that even an average actor can do. Being able to give a particular read in character at the drop of a hat. Or three different ones in a row with no hesitation. And that’s not even considering matching finished characters lip movement in anime dubbing, or hours of dialog, grunting and sound effects for video game voices. IKTV gives you insight into that from the people who are the top of their field. When the artists talk about the ranges they can stretch to that no normal acting would allow, you get a sense of the acting opportunities in voiceover. If you have the skills. I’ve heard DiMaggio talk about his craft on podcasts, and a documentary of just that would have been fascinating. He’s one of the best. But the documentary crew got tons of people to talk about the subject, clearly because they love this industry and the people in it. As a result, you get a real sense of the community and camaraderie in voiceover work, and how while it is not easy, everyone loves what they do. And they can love it without sugar coating it. They talk about being scared not working between jobs. They talk about not ruining their voices, and how it’s getting more competitive all the time. I’d say it’s a pretty even handed depiction of the industry. But if you don’t come away with more of an appreciation for the form than when you started watching it, then you’re crazy! I wanted more; a miniseries instead of just an hour and a half. I think that’s a testament to how engrossing it was. I highly recommend it to anyone interested in performance or animation.